Just when you thought nationalism had nothing good to offer the world, along comes a wonder like El Chaltén. 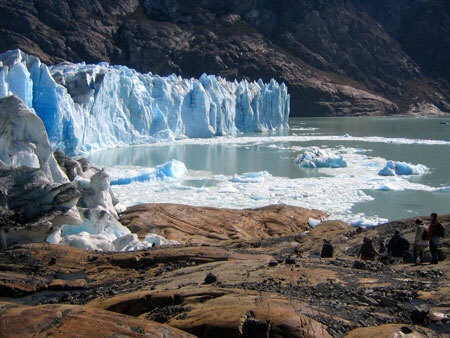 A town with no conceivable economic or geographic purpose other than sticking it to the nearby Chileans, El Chaltén (Spanish for The Chaltén) is an accidental hikers' paradise in what used to be one of the most inaccessible parts of southern Patagonia. Built by provincial decree in 1985, the town is four hours by jarring bus ride from the nearest anywhere and has no phone lines or ATMs, no library or cinema, just a grid of muddy frontier town streets, steakhouses, hostels, gift shops and a series of trailers mysteriously marked "Argentine Navy". Chile and Argentina share an enormous 5,150 km border, and along most of its length the official procedure for deciding which country you are in is unambiguous and simple. You wait for it to rain; if the water flows into the Pacific, you are in Chile, if it flows into the Atlantic, you are in Argentina. (If it fails to rain at all, you are probably in the Atacama desert and likely have more pressing problems on your hands than finding a notional geopolitical boundary). But in the Patagonian Ice Field, the water comes down as snow and doesn't go anywhere for thousands of years, making things a bit tricky. There's an awful lot of frozen white stuff here, it's not easy to climb around on, and it's especially difficult to figure out what kind of topography lies buried underneath. This part of South America is so remote and rugged that it remained a blank spot on the map until after World War II, when a typically meddling norteamericano aerial survey produced the first clear maps of the border region. To everyone's surprise, the ridgeline that had been assumed to separate Chile from Argentina turned out to be only the easternmost in a series of parallel ranges running under the glacial ice. In a humble display of deference to the immutable laws of science, Argentina instantly shifted its border several kilometers to the west and sent gendarmes in to annoy the few Chilean herders it could find on its newly-acquired sliver of icepack, demanding they register at the very distant provincial capital of Rio Gallegos. The herders got upset, some shots were fired, and soon there were loud cries for justice on both sides of the border, wherever that was. What prevented this - like every previous and subsequent Chilean/Argentine spat - from taking a more serious turn was the colossal hassle of having to go over the Andes in order to pick a fight. Even India and Pakistan, two countries with much larger armies and far greater reserves of mutual hatred, barely manage a few desultory mortar exchanges on their high disputed plateau, let alone a full-scale invasion over the ice. In order to crush the national enemy, a Chilean or an Argentine invading army would first have to cross the ultimate military buzzkill. Short of shipping everyone down to Tierra del Fuego, where the mountains run East-West (which nearly happened in 1978), the two armies don't have many options for getting at one another. Given the inconvenient topography, the two sides agreed to hand over the question of whose inalienable, indivisible and eternal Fatherland this shard of ice was to a bilateral border commission. Smothering any lingering hard feelings under a thick foam of bureaucracy, the commission deliberated at length before coming to its Talmudic solution, emerging with a border that zipped back and forth across the ice like an angry seismograph trace, at one place deviating some twenty kilometers east to the summit of Mount FitzRoy only to turn around and head right back. But even the border commission was stumped when it came to the area south of the mountain. And so on hiking maps you will see the fractal-like border fading into a blank stretch of white after the FitzRoy salient, with only a boxed admonition telling hikers to seek permits from both the Argentine and Chilean border patrol before venturing out on the ice. And somewhere in a Buenos Aires sub-sub-basement, a bilateral subcommittee is sitting through its 421st consecutive plenary session, sipping mate and trying to get this sorted out. Concerned about the wobbliness of the local border, the province of Santa Cruz decided to take matters into its own hands and in 1985 mandated the creation of a town to help assert Argentine sovereignty (a phrase that correlates suspiciously with making people live in icy wastelands). The government duly trucked in all the essentials needed to build a small Argentine mountain town - bricks, sheet metal, steak, hundreds of stray dogs - and the town of El Chaltén was born. 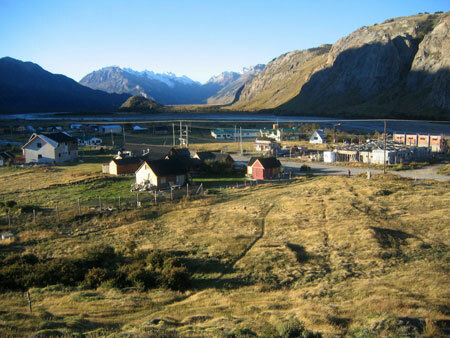 The town has grown and solidified since 1985, in part due to provincial subsidies, in part due to the large tourist market it created by transforming one of the more isolated corners of the Patagonian Andes into a readily accessible trailhead. Climbers especially go crazy over FitzRoy and the surrounding mountains; although they are not extravagantly tall by absolute standards, the harsh weather and smooth rock make the granite peaks very difficult to climb. More people summit Everest in a year than have ever made it to the top of FitzRoy. 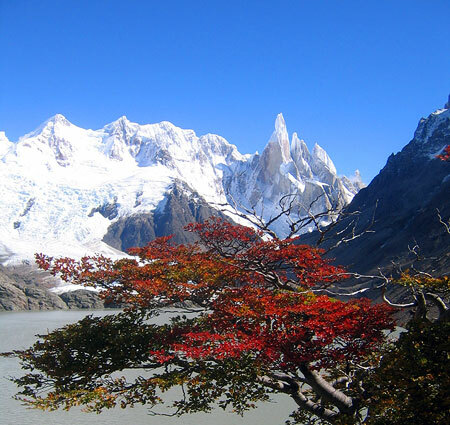 Unlike the Chilean side, where the weather is invariably challenging but also of short duration, FitzRoy can go for weeks hidden under steady fog and rain. It has a supporting cast of other mountains, such as Pueyrredón and the elegant needle of rock called Torre, that are equally hard to get on top of. Aspiring climbers come early in the season to camp out at the bottom of the mountain, waiting for a window of good weather in which to make attempt. At the end of the season, they pack up their kit and go home, coming back to try again the next year. Those few incautious or unlucky enough to attempt the climb in poor weather sometimes don't come back. With all their aggression expended on climbers, the mountains are perfectly civil to hikers, who can go right up to their base in perfect safety, if not always in great comfort. An extensive network of trails zigzags through the foothills here, and on the rare days when things are visible, the views make up for all the soggy waiting. Part of the spectacle has to do with the clarity of the air; the nearest upwind source of pollution is Japan, and if the air is not thick with rain then it is likely to be very clear indeed. To the south of El Chaltén is a large lake fed by the Viedma glacier, part of the large system of glaciers (including the Perito Moreno), that drains the Patagonian Ice Cap, In its heyday, the Viedma glacier was over a kilometer deep at this point, and extended two hundred kilometers out into the Patagonian steppe, but it been fighting a steady battle of attrition against global warming (the between-ice-ages kind, not the recent anthropogenic uptick) and is retreating at several dozen meters a year. What is left of it is sufficiently placid to allow tour groups to come walk around on top, under the watchful eye of a glaciologist tour guide. I had never walked on - or even thought of walking on - a glacier in my life, but after the booze-filled glacier cruises of the previous two weeks we were dying to try it. And so one sunny morning found us on a boat motoring its way down the north arm of the lake, threading between first little and then progressively bigger turquoise icebergs. As the boat approached the wall of ice ahead, the crew fitted us with crampons for walking on the glacier. These looked like little foot torture devices turned upside down, with long metal spikes protruding around the perimeter of the sole and heel. They strapped securely onto your boots and made you as sure-footed as a mountain goat. Disembarking on an undulating stretch of recently-exposed rock, our group walked along the carved flow lines to the point where the ice began. The rock here is high in iron and oxidizes to a beautiful rust color after the ice exposes it. The front of the glacier is a big lip of dirty snow hanging a good half meter above the rock face; it looks like it is floating unsupported above the ground. 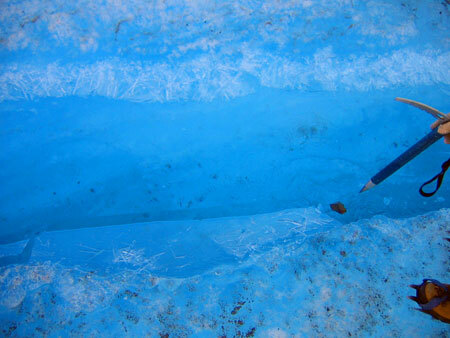 Seen from underneath, the ice and rock recede into dark blue shadow - you can't see where they touch. Walking in crampons reminded me of my first experience driving in San Francisco. The minivan I was riding in drove along a level street, turned left, and suddenly seemed to be climbing the vertical face of a building. After topping out at an intersection, it pitched nose-down and sped towards a crosswalk far below, a view of the top of pedestrians' heads filling the windshield. Later I would see buses and trucks perform this nonchalant miracle of traction, too, but I could never get used to it. The crampons give you this same feeling of defying gravity. Put them on and suddenly you can walk up a forty-degree incline of ice. This is the kind of footwear you fantasize about having on when you are drunk. The only risk is taking a misstep - or building up too much speed going downhill - that results in a rather painful forty-degree fall. The guide showed us the peculiar duck walk you need to move safely across the ice, and ways of arresting our motion before we plummeted into a crevasse and had our motion arrested for us by the glacier. Then we all stepped onto a little staircase courteously hacked into the lip of the glacier for us, and there we were on top of a glacier. The glacier was not child-safe. The crags of ice only jutted out a few meters into the air, but it was perfectly sufficient to kill you or break bones if you slipped and fell down the wrong side of a slope. The glacier was also surprisingly dirty. There used to be a kilometer of ice here, and all of the sand and rock scrapings it carried had collapsed down into a few meters of remaining ice and snow. In many places there were long linear features of pebbles and rocks lying along the top of the ice. These would form when a fissure opened in the glacier, allowing rocks embedded in the sides of the crack to fall to the bottom. In many places you could still see walls of ice that looked like Swiss cheese, with the larger bits of trapped rock having broken out the side, sometimes helped out by preferentially absorbing sunlight and melting their way to freedom. There were lakes in the glacier where the meltwater had collected into crevices without draining. The walls were the trademark otherworldly blue color of glacier ice, the water between covered with a protective clear layer of ice you could poke stones through. Photographs can capture the color, but not the strange sensation of looking down into a three-dimensional world of water and ice below, backlit rather melodramatically by light that had filtered down through other gaps. The physiological feeling of being surrounded by big icy blue things is what makes glaciers so addictive; there is something so unnatural and striking about it that you are constantly operating at a high level of attention. The landscape is familiar from endless winters looking at shoveled snow, but here it is two orders of magnitude larger, punctuated with that strange chemical blue, and you are a small bug walking in the middle of it. Towards the end of the hike, we learned about the biggest difference between the Viedma glacier and other glaciers along the Patagonian Ice Cap, which is that instead of Old Smuggler you are served Bailey's Irish Cream, poured into little plastic glasses with chunks of sandy glacier ice. The hikers, still shaky on their crampons, were given a cautious two inches, but the tour leaders didn't hesitate to fill their cups to the brim.